If you or someone you love is living with "foot drop" - neurological damage causing the foot to droop or not lift properly during walking - you recognize that sometimes alternative help is needed other than leg braces or exercises for foot drop. Foot drop, also known as drop foot, is usually caused by a stroke, cerebral palsy or spinal cord injury, or it can be one of the early symptoms of multiple sclerosis. But fortunately, life with foot drop can be improved - and recently, more than ever! 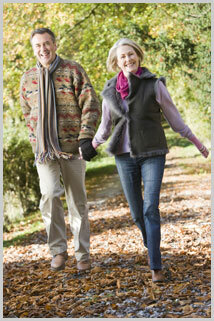 Traditionally people with this condition were limited to wearing orthoses (braces) to help them walk. Dramatic advances in medical technology, however, have resulted in the small, discreet device known as the WalkAide that uses sensors to alleviate foot drop. Attached just below the knee, on the outside of the leg, the WalkAide fits beneath most clothing, doesn't require special footwear, and even means you can wear sandals again! And it's designed for one-hand application, so you don't need any help getting WalkAide on. WalkAide Electrodes are Like "a Brain in a Box"
The WalkAide has been described as "a brain in a box" because it sends messages that would normally come from your brain to your muscles, using sensors that analyze how your foot and leg move. The adaptive technology, known as neuro-prosthetics or myo-orthotics goes beyond the traditional brace; it uses gentle electrical stimulation to restore nerve-to-muscle function. Functional Electrical Stimulation (FES), built into the WalkAide, is programmed by a Certified Orthotist to create a "foot lift" at the appropriate times during the gait cycle unique to that person. The WalkAide comes with a pre-programmable exercise mode; you can exercise your leg and foot muscles while resting, for a period of time as set by your physician. Exercise is possible while wearing WalkAide because the device is so small - about the size of a deck of playing cards, on a strap - and simple, consisting of a battery-operated, single-channel electrical stimulator, two electrodes, and electrode leads. And WalkAide won't fall off; it's wrapped in a flexible cuff that goes around your leg. I've had a stroke, brain injury or spinal cord injury. I'm living with cerebral palsy or multiple sclerosis. I've been diagnosed with foot drop by a doctor. I currently wear a brace for foot drop. I don't feel safe or stable enough when I walk. I miss out on important events because I have a hard time walking. I don't wear a pacemaker. In Canada, the WalkAide device is only available by prescription from a medical doctor. 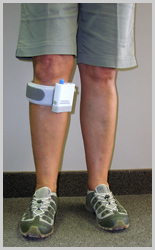 Customized fitting, assessment and programming of the device can only be provided by a Certified Orthotist. The Certified Orthotists at Custom Orthotic Design Group Ltd. have taken the advanced training in the assessment and provision of the WalkAide device, in order to bring this breakthrough technology to their clients. WalkAide was developed in the '90s by a team of researchers at the University of Alberta in Alberta, Canada. Custom Orthotic Design Group Ltd., your trained and accredited providers of WalkAide, is a proudly Canadian-owned and operated company. Complete the form at the bottom right of this page, call or email Custom Orthotic Design Group to set up an appointment in our Mississauga or Guelph locations for a free assessment of WalkAide.